Heat oil in a saucepan on high. Cook beef in 2-3 batches, 5-6 minutes each, until browned all over. Remove from pan and set aside. Reduce heat to medium. Saute onion 3-4 minutes, until lightly golden. Stir in garlic, chilli, ginger, curry powder, sugar and turmeric. Cook 1-2 minutes, until fragrant. 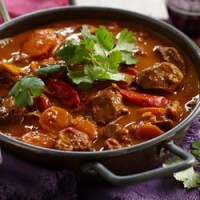 Return beef to pan with carrot, stirring, 1 minute, to coat in spices. Add coconut milk, tomato, water and fish sauce. Bring to boil. Reduce heat to low. Simmer covered, 40-45 minutes, until beef is tender. Serve topped with coriander leaves, a torn baguette for dipping and lime wedges.